Houston Then & Now explores how the buildings, streets and institutions that comprise Houston’s cityscape have transformed over the years—for better or worse. What was once a sleepy village on the banks of Buffalo Bayou is now America’s fourth-largest city. From the days of the Republic of Texas to the War Between the States, King Cotton and the transformative power of global-scale oil wealth—Houston’s unique journey through Texas and American history has produced what Smithsonian Magazine calls “The Next Great American City.” This book is a photo-rich journey of the places, institutions and buildings around town that have been lost in the mists of time along Houston’s 175+ year journey from hardscrabble to skyscraper. Subjects include long gone buildings from the 1800s that include the old capitol building of the Republic of Texas, the original Rice Hotel (first called the Capitol Hotel), the first Binz Building, the Houston Light Guard Armory, Grand Central Station, the old Houston Ice & Brewing Company, the Moorish Federal building at Fannin and Franklin, the Houston Lyceum and Carnegie Library, Houston’s first network of electric light rail lines, the original wooden buildings on Main Street and more. In the early 20th century, Houston blossomed—and Lost Houston captures many interesting things lost to that time such as the grand old No-Tsu-Oh parade, the Lucas Gusher at nearby Spindletop and more. Houston Then & Now showcases 70+ major landscapes around town such as famous buildings, mansions, courthouses, streets, businesses, monuments, universities--and even the Lynchburg Ferry! Favorites include NASA, the Kennedy Bakery (today La Carafe), the Shamrock Hotel, City Hall, Carnegie Library, Houston Courthouse, Merchants and Manufacturers Building, Allen's Landing, Houston Chronicle, Main and Preston, Sam Houston Hotel, the USS Texas, San Jacinto Monument, Congress Avenue, Houston Water Works, Hermann Building, Texas Capitol Building, Majestic Metro, Old Cotton Exchange, Gulf Building, Moorish Federal Building, Carter’s Folly, Kress Building, Union Station, Esperson Building, Antioch Church, Houston Light Guard Armory, Magnolia Brewery, Grand Central Station, Rice University, Museum of Fine Arts, Hermann Park, Miller Outdoor Theatre, and Warwick Hotel (today the ZaZa). 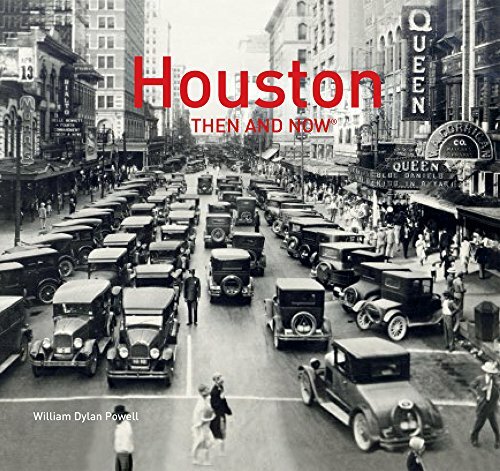 Things change quickly in The Bayou City, and Houston Then & Now is a great big-picture overview of how far our city has come since its founding in 1836. Order Lost Houston on Amazon and get your copy in two days with Amazon Prime!